Singapore-based Hotel Properties Ltd (HPL) plans to expand its hotel portfolio in Sabah, with a view to snap up distressed hotels there. Businessman Tan Sri Syed Yusof Tun Syed Nasir said the company sees opportunities to buy hotels and resorts in Sabah at a discount from their existing owners who have been hit by the current economic slowdown. 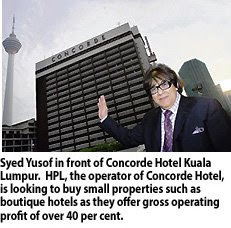 HPL, which is controlled by founder and property tycoon Ong Beng Seng, manages Concorde Hotel Kuala Lumpur, Concorde Shah Alam, Concorde Inn Sepang, Casa Del Mar Langkawi and The Lakehouse in Cameron Highlands. "There are always expansion plans within the HPL group. We will buy, if the price is right. By doing so, we will be creating new employment. "In hospitality, it is sad to see hotels close or a big (number of) staff being laid off," Syed Yusof, who is a shareholder of HPL, told Business Times in an interview. The company is looking to buy small properties such as boutique hotels as they offer gross operating profit (GOP) of over 40 per cent. For instance, the GOP for Casa Del Mar and Concorde Kuala Lumpur were 45 per cent and 38 per cent, respectively, higher than the 35 per cent for the remaining properties. "I don't think we should miss the boat. (Sabah's) eco-tourism is booming. If we buy a property in Sabah and keep it unique, it should sell like hot cakes," Syed Yusof said. HPL is also mulling to set up a Hard Rock Cafe in Kota Kinabalu and buy a resort in Sipadan Island. "These plans are still preliminary. If we can manage the resort in Sipadan Island professionally, there will be good money," Syed Yusof said. While the plans look good on paper, Syed Yusof is aware that hospitality is not an easy business to run and is vulnerable to terrorism, diseases and a recession. "Malaysia will always be indirectly affected when the world is in crisis. Hospitality is a vulnerable business, with slow returns and huge capital. A lot of hard work is involved to keep the business afloat. It's not all that rosy as one may think it to be," he added. Syed Yusof said the most important things in this business are dedication and cash flow to make it work. "To succeed, one must also have good partners, management and staff. For instance, our partner, Ong, is internationally recognised and thus, we have no qualms about buying properties in good or bad market conditions," he said. On why he has been staying in the business for over two decades, Syed Yusof said it was because of his passion for the industry. Concorde Kuala Lumpur, formerly Merlin Hotel, on Jalan Sultan Ismail is Syed Yusof's first hotel venture in 1990, after halting from property development activities temporarily. "Our partners (referring to Ong and Sultan Sharafuddin Idris Shah of Selangor) are dedicated in tourism. Our group is ready to assist the Tourism Ministry in new developments for the sector," he said. MALAYSIA'S Glomac is cutting its property sales target by half for fiscal 2010 as the global economic downturn hit buyers’ confidence, said a top executive today. The property developer aims to sell houses, shop lots and offices worth about RM400 million in the year to April 2010, down from its previous target of RM800 million, said its Managing Director Datuk Fateh Iskandar Mohamed Mansor. “At this moment in time, looking at the weak take up rate of our properties, I have to be conservative,” Fateh told Reuters in an interview. The company is in “advanced talks” to sell en bloc a 25-storey corporate tower at Glomac Damansara, a mixed commercial and residential development, said Fateh. The building has a market value of about RM170 million, he said. “We hope to complete the sale by the end of the year. If that happens, these are bonuses,” said Fateh. SEGAMAT: KSL Holdings Bhd will be launching its first mixed property development project in the Klang Valley in the first quarter next year. Executive director Ku Hwa Seng said the Bandar Bestari project would be sited on 180.64ha of freehold land in Jalan Klang-Banting, about 15km from the Klang town centre. “The project, with a gross development value of RM2.5bil, will keep us busy for eight years,” he told StarBiz after the company’s AGM last week. Ku said the initial launch would comprise 300 to 500 cluster homes and, when fully completed, the development would have 8,000 cluster, semi-detached and bungalow houses. As a new player in the Klang Valley property market, the company would offer attractive pricing during the initial launch of the cluster homes, he said, adding that the entry price for the homes would be much lower than those offered by other players in the market “to create awareness and interest” among buyers. He said the project’s freehold land would be the main selling point as not many residential property developments in the Klang Valley still had that status. Ku said the company would be targeting potential customers currently residing in Klang, Shah Alam and Subang Jaya. As at Dec 31, 2008, the company had a total land-bank of about 874ha in Klang, Johor Baru, Batu Pahat, Kluang, Segamat, Muar and Mersing, with 45% located within Iskandar Malaysia. Currently, it has four ongoing projects in Johor Baru – Taman Nusa Bestari, Taman Bestari Indah, Taman Kempas Indah and KSL City – and Maharani Riviera in Muar. For the financial year ended Dec 31, the company registered net profit of RM90.50mil on revenue of RM216.24mil against RM118.16mil and RM277.41mil respectively in the preceding year. KUALA LUMPUR: Naza Group of Companies will have its own new main headquarters by 2013 when construction of the 50-storey Naza Tower at the Platinum Park is completed. Group executive chairman and chief executive officer SM Nasarudin SM Nasimuddin said the tower would be built on a 1.2-acre site with a net floor space area of about 532,470 sq ft.
“We hope the tower’s strategic presence within the KLCC vicinity will be exceptionally attractive to commercial tenants, both domestic and international,” he said yesterday at the ground-breaking ceremony for Naza Tower. This is the second tower launched at the RM4bil high-end integrated residential and commercial development at the 9.1-acre Platinum Park, following the launch of the Menara Felda last year. Developed by its own subsidiary, Naza TTDI Sdn Bhd, the Platimum Park is set to be the single largest luxury development undertaken by a bumiputra company in the heart of Kuala Lumpur. Nasarudin said the tower was also designed to be a “green building” with the efficient use of energy, water and materials and would be among the first candidates to apply for a “green” mark certification under the newly-launched “Green Building Index” of Malaysia. “We have always wanted to have a very visible, easily recognisable and accessible location right in the heart of the nation’s capital. Naza Tower will give us the opportunity to serve our customers better by showcasing our products in what we believe is the best location possible,” he said. Going forward, Nasarudin said, Platinum Plaza when fully completed would have seven towers, comprising condominiums, grade A offices and service residences which were scheduled for completion by 2018. Apart from Menara Felda that was sold in 2008, a 38-storey building next to the Naza Tower, which has yet to be launched, has also been sold to a yet-to-be-disclosed buyer. HWANGDBS Vickers Research has maintained its buy call on KLCC Property Bhd (KLCCP) at RM3.20 with a target price of RM3.70 as it has the most defensive earnings in the sector from locked-in rental income from blue-chip tenants on long-term leases. It added that although there has been a recent shift from luxury to 4-star business hotels, Mandarin Oriental’s occupancy rate was still at a respectable 65% and the company has no plans to cut its high average room rate (ARR) of RM635 per room per night. However, KLCCP was actively seeking new markets which could prove challenging in the short term given the ongoing global financial crisis and Influenza A (H1N1) outbreak. Also, Suria’s retail extension was expected to be completed by mid-2010 and would be fully operational by end-2011, it said, adding the office tower was scheduled to be completed by end-2011. “Negotiation for a potential single anchor tenant on a long-term triple-net-lease basis is still ongoing, with rental expected to be between current rates for Maxis Tower and Petronas Twin Towers. 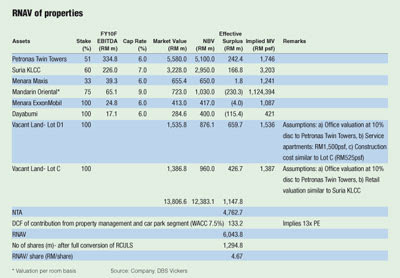 “Lot C could potentially bring in RM135 million of annual rental from FY13 onwards,14% gross yield based on estimated rental of RM10 per sq ft,” it said. It noted that with the abolishment of Foreign Investment Committee (FIC) approval and bumiputera equity requirement for mergers and acquisitions (M&As), commercial and international standard properties would be the biggest beneficiaries. The research house also said that RM150 million to RM200 million of annual cash flow would be freed up for potential M&As and/or dividends after the maturity of Twin Towers’ debts in 2012. The Twin Towers’ rental revision of 9% every three years (next one scheduled in November to RM9.50 psf) provides support to cash flows (but no earnings impact due to straight-line recognition of lease income per FRS117). It added KLCCP has fully exhausted its S108 credits, so future dividends would be single-tier as in 25% tax payable versus shareholders’ tax bracket previously. FY09 financing cost fell 10% on the back of two debt refinancing exercises (Mandarin Oriental and Suria) and improved net gearing (33% vs FY08’s 40%). “FY10 will see full-year impact of the debt refinancing and rental revision for Menara Exxon Mobil (constitutes 3% of Ebitda). This should help cushion the weaker hotel contribution, while bulk of earnings would come from locked-in rental income from blue-chip tenants, including parent Petronas,” it said. Meanwhile, CIMB Research downgraded KLCCP to underperform due to lack of positive catalysts and increasing preference by investors for higher beta developers. “Although dividend yield of the stock at 4% can be considered decent compared with fixed deposit rates of 2%-2.5%, it pales in comparison with Malaysian REITs which average 10% as well as the broader market at 5%,” CIMB said. In addition, the outstanding RM688 million 1% redeemable convertible unsecured loan stocks (RCULS) are eligible for conversion into ordinary shares at RM1.98 starting August, it said. If converted, it would enlarge the group’s share capital by 37% to 1,281.5 million shares. “If the RCULS are not converted over the next five years, on the 10th anniversary they can be converted at a conversion price of only RM1. “This would expand the share cap by a wider 74%. KLCC Prop management will seek to minimise the dilutive impact on existing shareholders,” the research house said. KLCCP closed at RM3.16, down four sen.